This stuff is a like a dream come true. It’s this amazingly creamy, caesary, asian flavor, with only 14 calories in a tablespoon!! The miso flavor is not overwhelming and it tastes good on everything. And I mean EVERYTHING. I put it on salads, dip raw veggies into it, put it on veggie burgers and hamburger buns. When the whole foods in tribeca was out of this stuff, I literally scoured every whole foods in the local vicinity so i could stock up again. Yea I know…obsessed. While I’ve never been a big jam person…this stuff literally tastes like pumpkin pie in a jar. In the mornings, I’ll spoon a little into my greek yogurt — it sounds a little odd, but literally tastes like a pumpkin pie yogurt parfait explosion of deliciousness. It’s also quite delicious on whole wheat toast and lowfat vanilla frozen yogurt. And to top it off, there are no added preservatives or other yucky things that other jams have — it’s just pumpkin, maple syrup, and spices. Yum! A couple weeks ago I was sitting in class, when one of my classmates whipped out one of these bad boys and started eating. I was astonished. 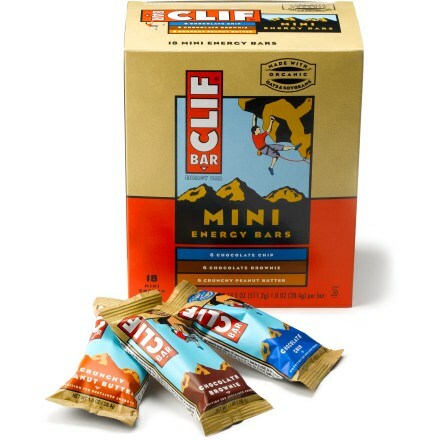 Mini clif bars?? What is this nonsense? Usually Clif bars are ginormous energy bars that are not exactly what I need on an average day. However, as my runs for the marathon keep getting longer…I was hoping to find something to eat along the way that would keep me going, but not make me want to puke (powerbar energy gels are disgusting!). I picked up a box of these babies (100, 110 calories each). Not only do that fit perfectly in my running belt, they make a perfect, portion-controlled snack when you need a quick energy boost. As someone who is always freezing, tea is an important staple in my pantry. I’m constantly on the lookout for new, yummy flavors of tea. 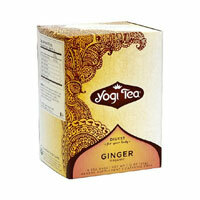 A couple years ago I tried out Yogi ginger tea and it is beyond delicious. Ginger is great for digestion and circulation, and this version of tea is gingery without being too spicy or overpowering. Perfect for curling up on the couch with at the end of a long day (or in this case rainy) day. Most reasonable minds can agree that on Dessert Island it’s absolutely critical to have access to a superb cookie, decent lava cake, or — depending of course on climate — a basic ice cream base. But the real question for Dessert Island is whether or not there are proper baking faculties. You could make a ho hum time of Dessert Island with store bought pastries or a cheap pre-baked cake, but where’s the fun in that? Assuming I’d have at the absolute bare minimum access to a simple range, measuring tools, quality cookie sheet, mixing bowls, and cake pans, my list of Dessert Island essentials is relatively short and sweet (pardon the pun). Baking soda. Yes. Sugar? Absolutely. A fine, rich flour (none of that whole grain wheat stuff, yuck)? Aye aye! Confectioner’s sugar is of course a must, along with the full gamut of heavy creams, butter and margarine (to give my cookies that extra fluff). Milk could be difficult, so I’d hope for a few dairy cows on Dessert Island. Cocoa? Don’t be silly, you know it sister! And don’t forget the brown sugar, baby. I’m sure I’ve left out plenty of essentials – but I think this list would be plenty to really get the desserts flowing on my personal slice of Dessert Island.